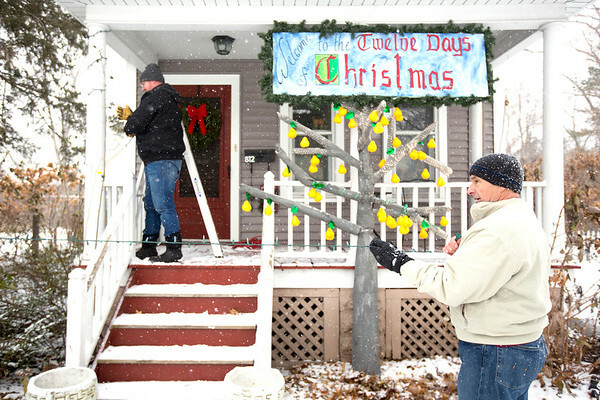 Matt Durren, left, wraps lights around a house's porch while Rich Odell unwrapped another string of lights. Odell came up with the idea to have his block participate in the "12 Days of Christmas" this holiday season. The different houses have home-made decorations for each of the 12 days and one "Happy New Year" house. "I just need something creative to do in my spare time," Odell said. The decorations will be lit up starting Saturday night and will be on from 5-10 p.m. through Christmas Eve.